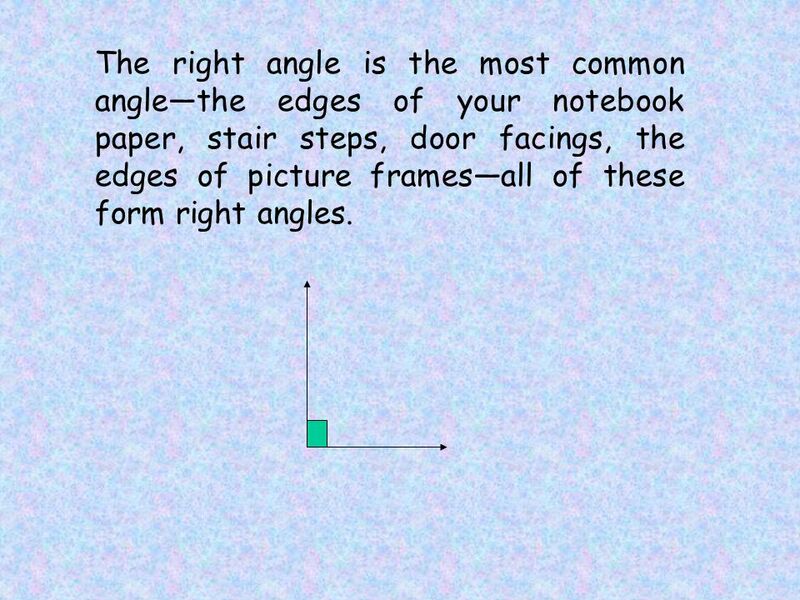 2 The right angle is the most common angle—the edges of your notebook paper, stair steps, door facings, the edges of picture frames—all of these form right angles. 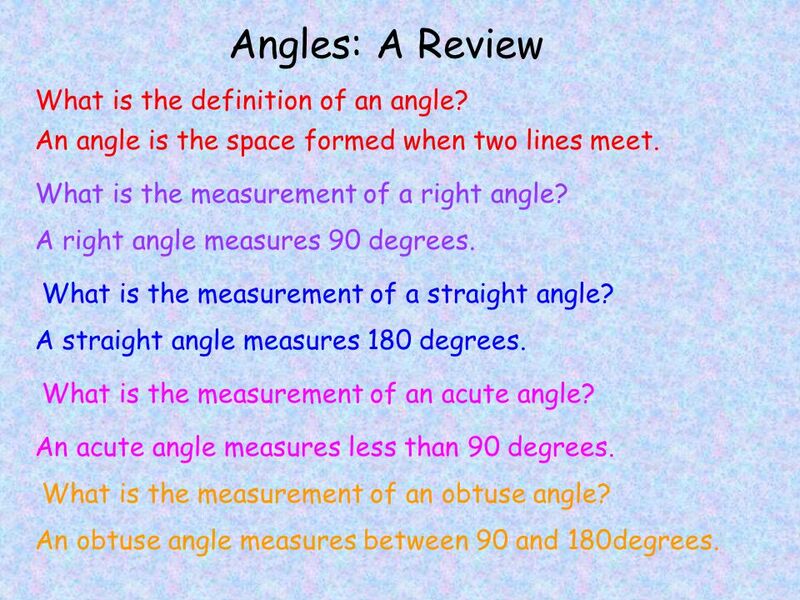 4 Angles: A Review What is the definition of an angle? What is the measurement of a right angle? An angle is the space formed when two lines meet. A right angle measures 90 degrees. What is the measurement of a straight angle? What is the measurement of an obtuse angle? What is the measurement of an acute angle? An acute angle measures less than 90 degrees. A straight angle measures 180 degrees. An obtuse angle measures between 90 and 180degrees. 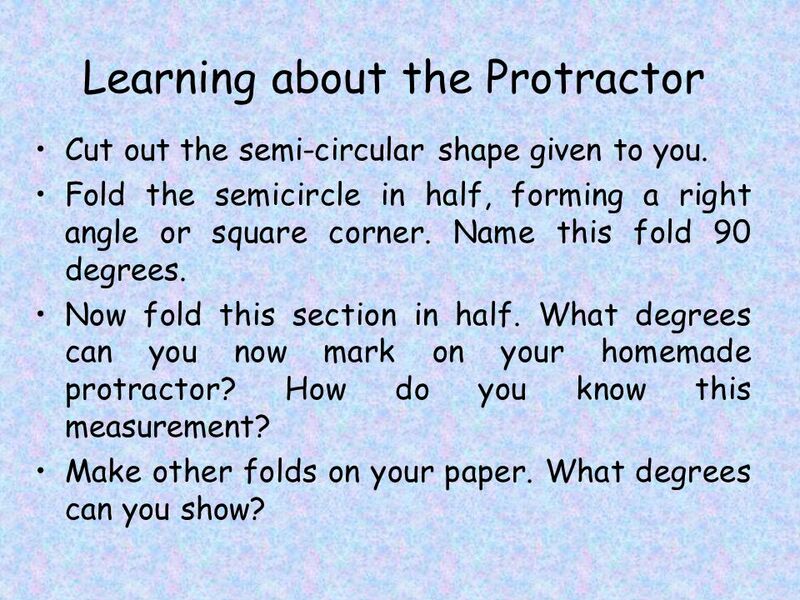 5 Learning about the Protractor Cut out the semi-circular shape given to you. Fold the semicircle in half, forming a right angle or square corner. Name this fold 90 degrees. Now fold this section in half. What degrees can you now mark on your homemade protractor? How do you know this measurement? Make other folds on your paper. What degrees can you show? 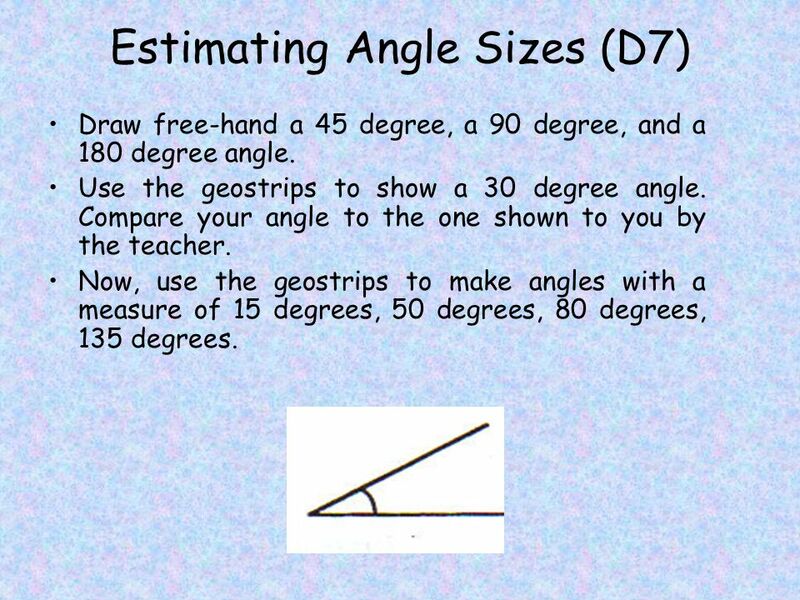 6 Estimating Angle Sizes (D7) Draw free-hand a 45 degree, a 90 degree, and a 180 degree angle. Use the geostrips to show a 30 degree angle. Compare your angle to the one shown to you by the teacher. Now, use the geostrips to make angles with a measure of 15 degrees, 50 degrees, 80 degrees, 135 degrees. 7 Let’s Practise! Write the numbers 1 to 6 on your paper. 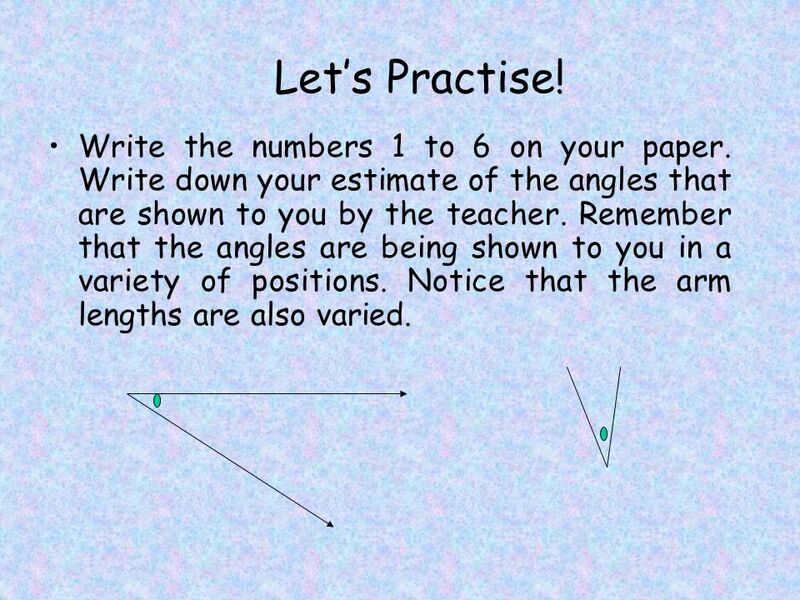 Write down your estimate of the angles that are shown to you by the teacher. Remember that the angles are being shown to you in a variety of positions. Notice that the arm lengths are also varied. 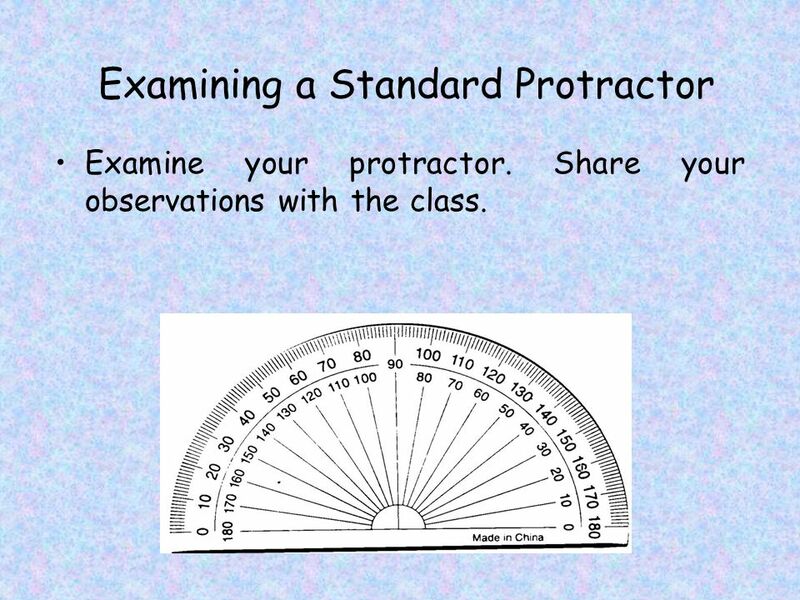 9 Examining a Standard Protractor Examine your protractor. Share your observations with the class. 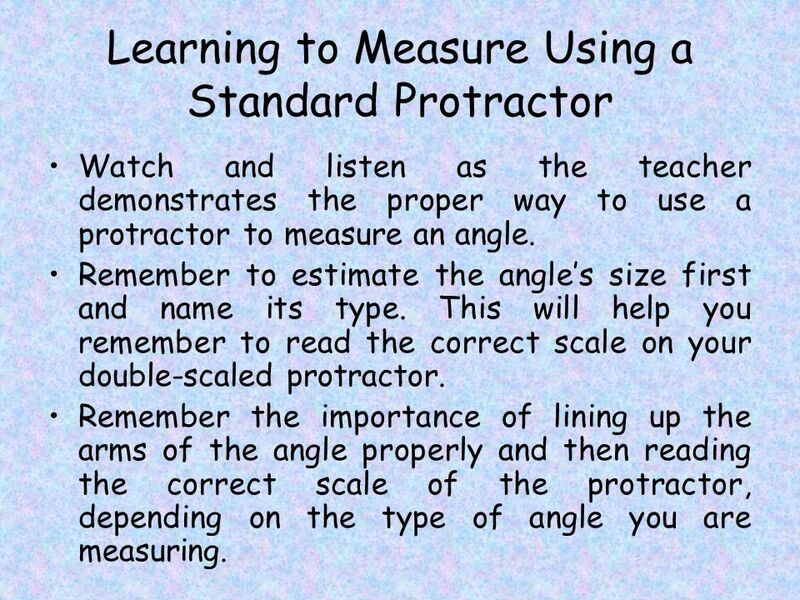 13 Learning to Measure Using a Standard Protractor Watch and listen as the teacher demonstrates the proper way to use a protractor to measure an angle. Remember to estimate the angle’s size first and name its type. 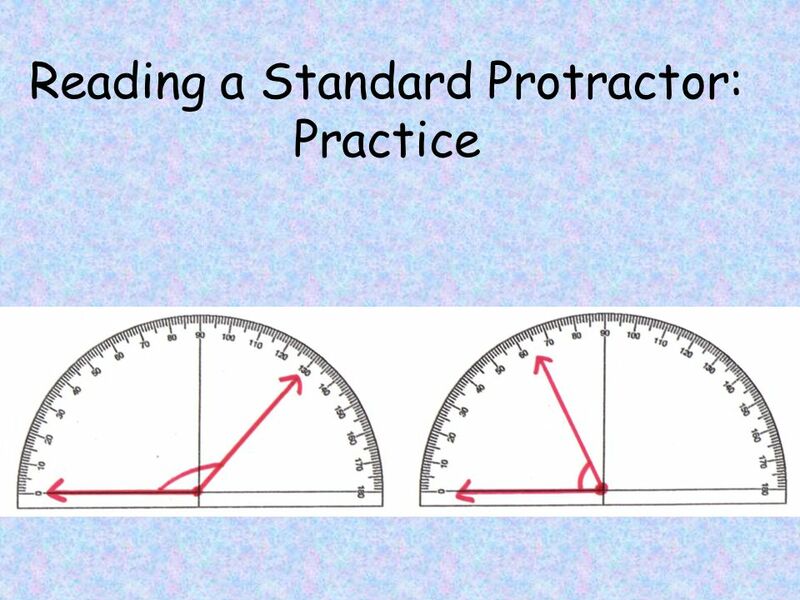 This will help you remember to read the correct scale on your double-scaled protractor. 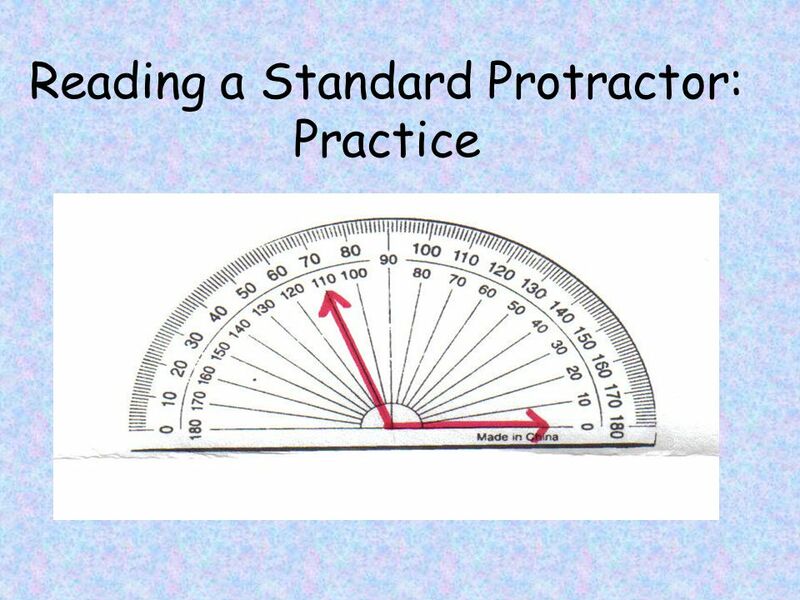 Remember the importance of lining up the arms of the angle properly and then reading the correct scale of the protractor, depending on the type of angle you are measuring. 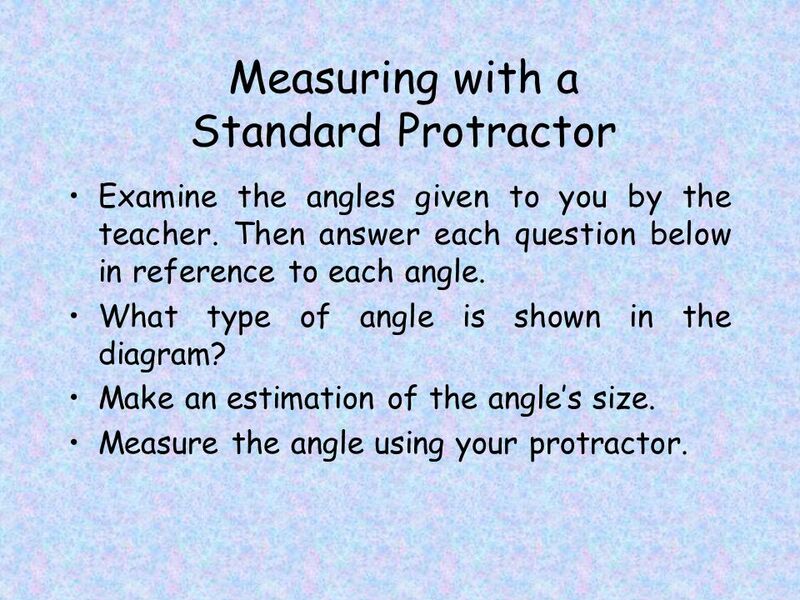 14 Measuring with a Standard Protractor Examine the angles given to you by the teacher. 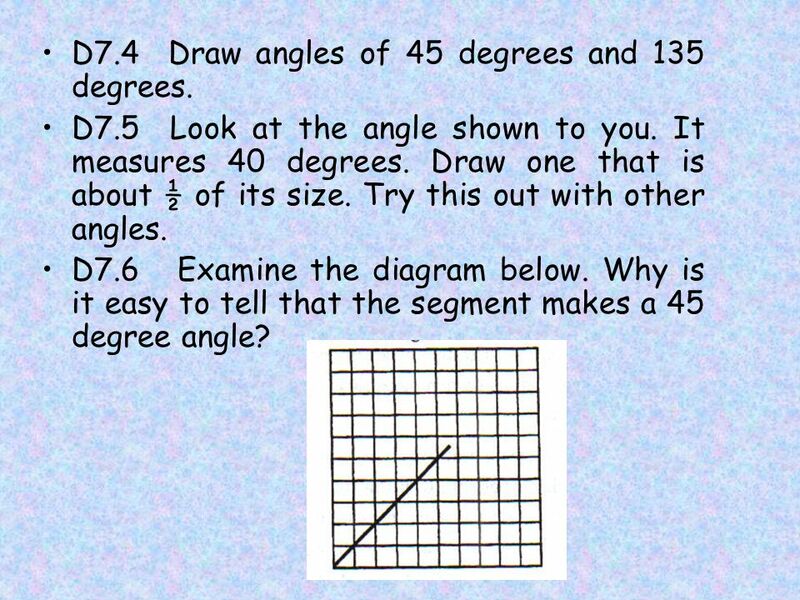 Then answer each question below in reference to each angle. What type of angle is shown in the diagram? Make an estimation of the angle’s size. Measure the angle using your protractor. 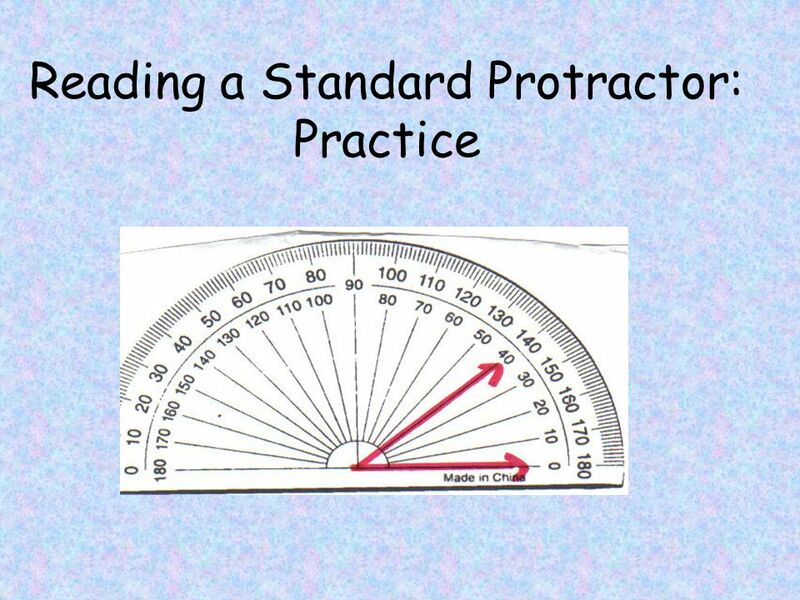 15 Student Activities D7.1 Estimate and then use your homemade protractors to approximate the measures of a variety of angles shown to you. D7.2 Examine several printed capital letters that are made with only line segments. Classify their angles as right, acute, or obtuse. Estimate their sizes in degrees. Then measure them. D7.3 Work with a partner. One of the partners should make an angle while the other estimates its size. 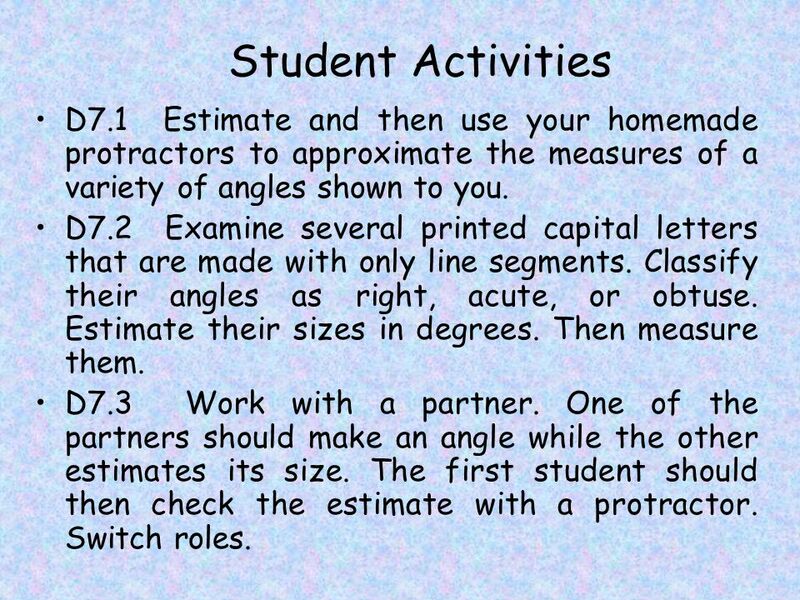 The first student should then check the estimate with a protractor. Switch roles. 16 D7.4 Draw angles of 45 degrees and 135 degrees. D7.5 Look at the angle shown to you. It measures 40 degrees. Draw one that is about ½ of its size. Try this out with other angles. 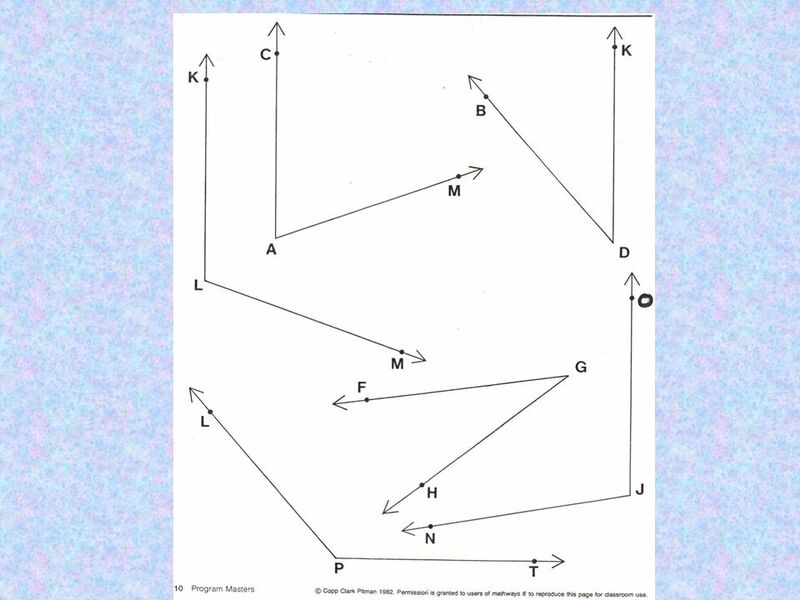 D7.6 Examine the diagram below. Why is it easy to tell that the segment makes a 45 degree angle? 17 D7.7 Look at the angle below. John measured it with his protractor and stated, “That is a 45 degree angle!” Explain how you think John could have made such a mistake. D7.8 Which angle sizes do you find easiest to estimate? Why? 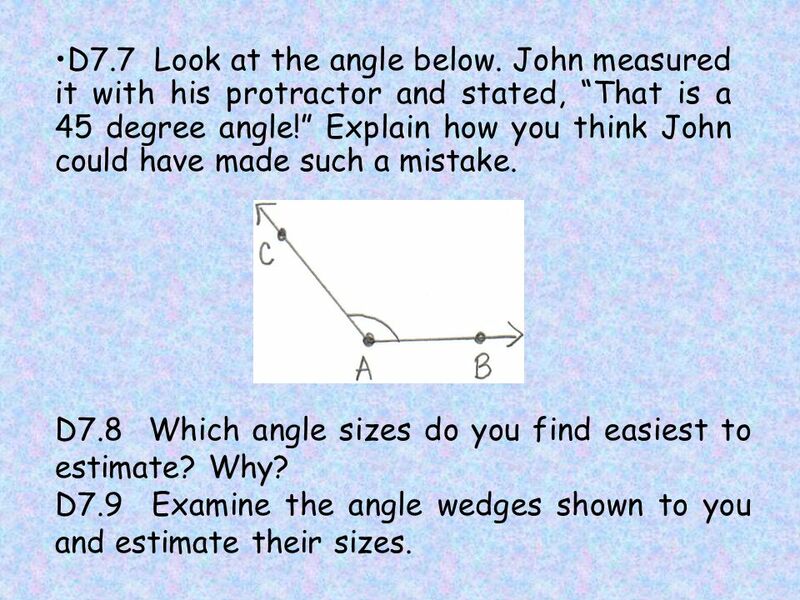 D7.9 Examine the angle wedges shown to you and estimate their sizes. 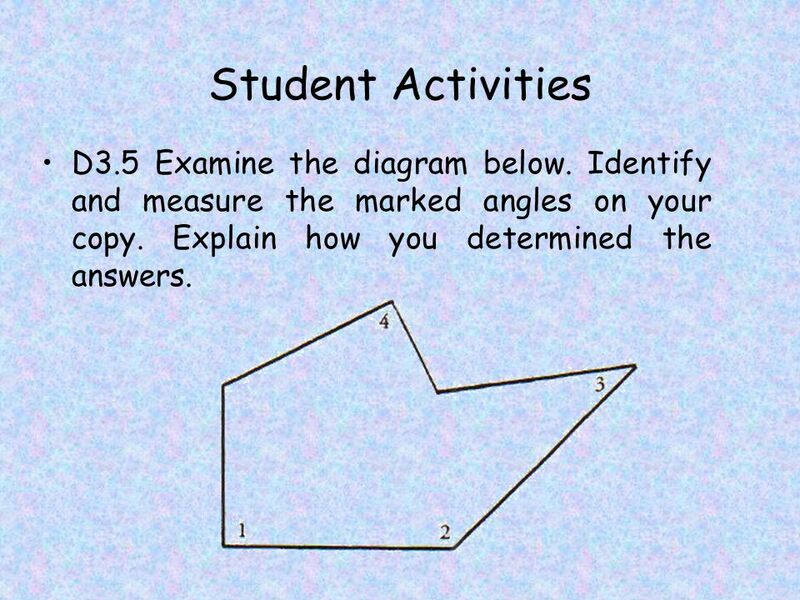 18 Student Activities D3.1 Estimate and draw acute angles that are less than half the size of a right angle. Check the angles you have drawn by measuring them. D3.2 Put three green pattern blocks together to make a trapezoid. Examine where the three blocks share a common point. How many degrees are in the straight line formed by the blocks? What must the measure of each angle in the green blocks be? Try to find the measures of the angles in the other pattern blocks without using a protractor? 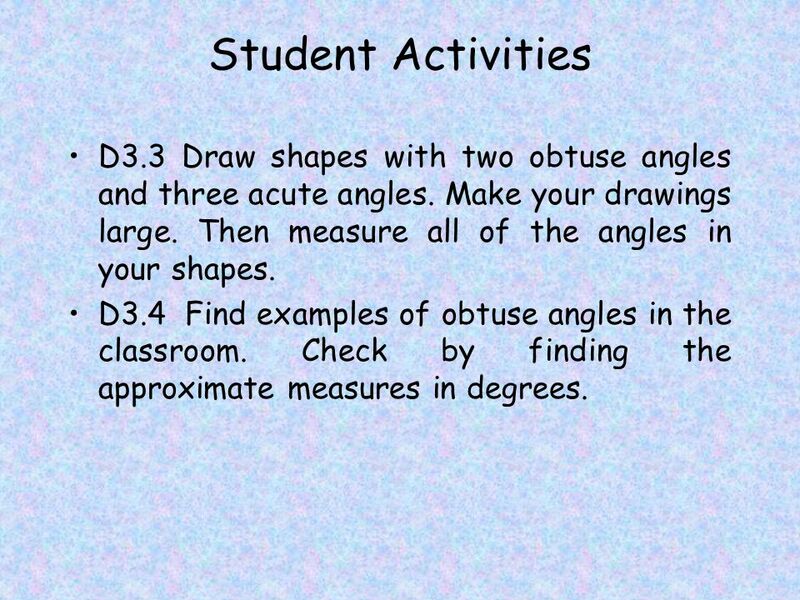 19 Student Activities D3.3 Draw shapes with two obtuse angles and three acute angles. Make your drawings large. Then measure all of the angles in your shapes. D3.4 Find examples of obtuse angles in the classroom. Check by finding the approximate measures in degrees. 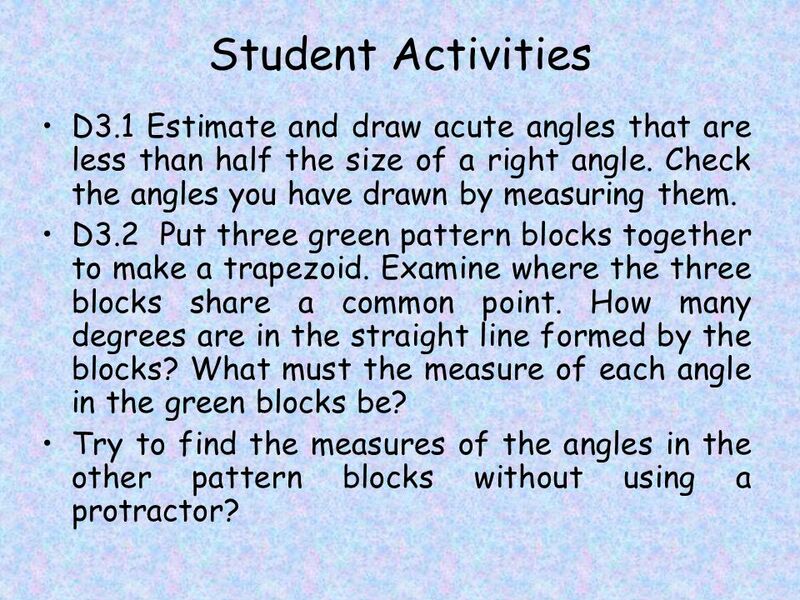 20 Student Activities D3.5 Examine the diagram below. Identify and measure the marked angles on your copy. Explain how you determined the answers. 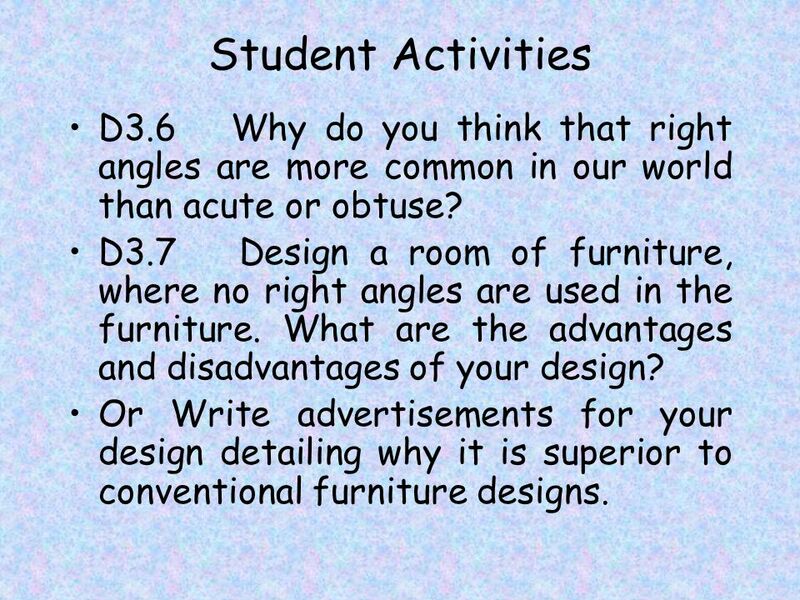 21 Student Activities D3.6 Why do you think that right angles are more common in our world than acute or obtuse? D3.7 Design a room of furniture, where no right angles are used in the furniture. What are the advantages and disadvantages of your design? Or Write advertisements for your design detailing why it is superior to conventional furniture designs. 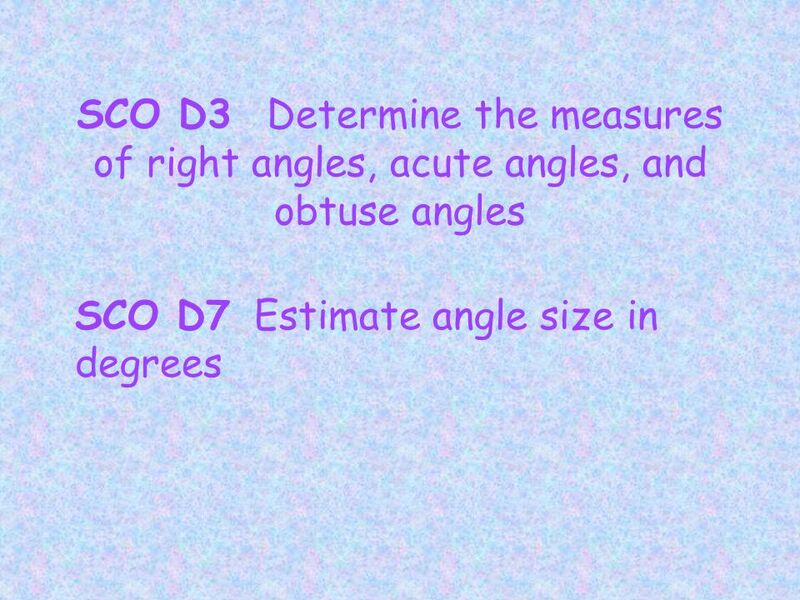 Download ppt "SCO D3 Determine the measures of right angles, acute angles, and obtuse angles SCO D7 Estimate angle size in degrees." E6 Students will be expected to recognize, name, describe, and represent perpendicular lines/segments, bisectors of angles and segments, and perpendicular-bisectors. CLASSIFYING ANGLES MEAP REVIEW. 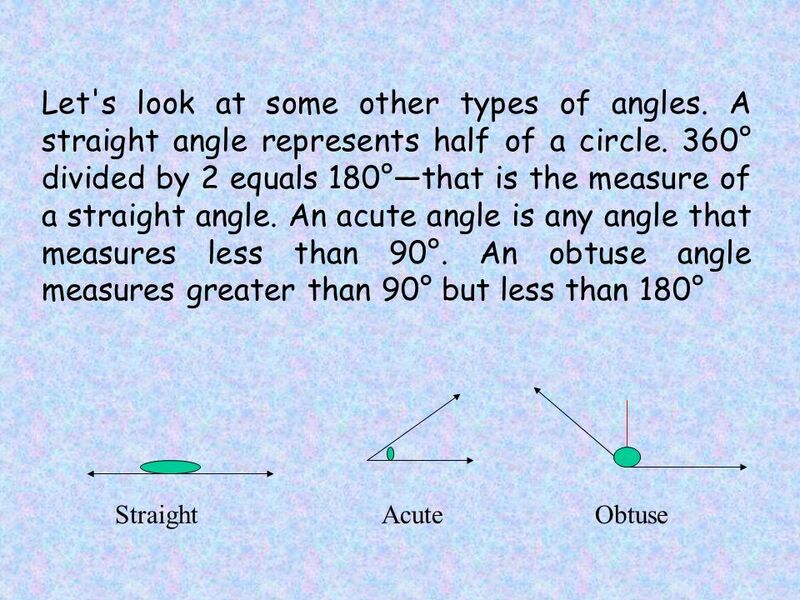 Degrees: Measuring Angles We measure the size of an angle using degrees. 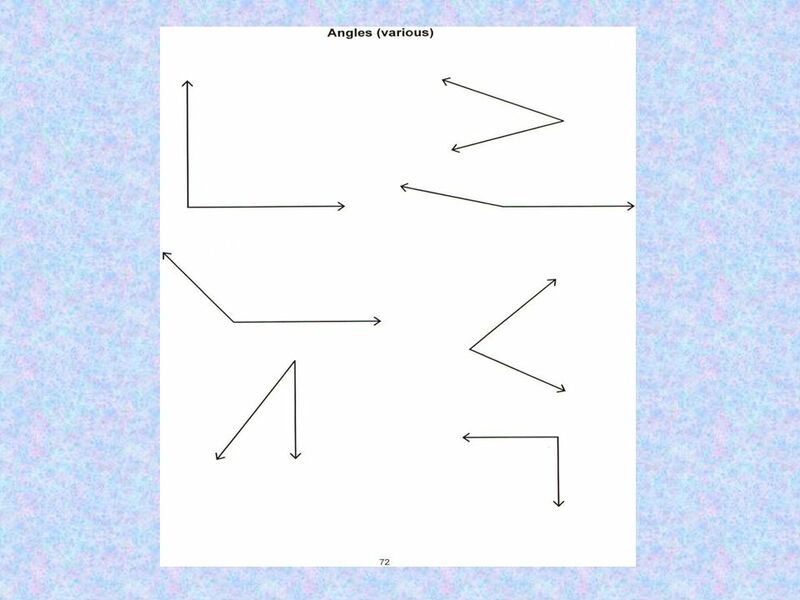 Example: Here are some examples of angles and. Activity 1 Activity 2 Introduction Activity 3 New words Angles Rotate Arms of the Angle Each student has two Geostrips: two of the same colour and length. Copyright © Ed2Net Learning, Inc.1 Angle and Angles Measurement Geometry. 1.3: Day 1 - Angles. Triangles can be sorted in different ways.  One way is by the length of their sides. Examine, or look closely, at the triangles in this picture. What. Degrees: Measuring Angles We measure the size of an angle using degrees. Example: Here are some examples of angles and their degree measurements. 1. Draw two points. Label one point A and the other point B.